A blank white canvass blossoms into vibrant rainforest the forest bursts into life birds become men trees fashion themselves into limbs their roots burrow deep inside where dark rhythms pulse the heart of the Amazon drumming in my head soothed by butterfly wing washed clean by torrents drenched in the passion of dance. This came to me during and after watching a performance of ‘Água’ by the Tanztheater, Wuppertal. I am not a fan of modern dance. 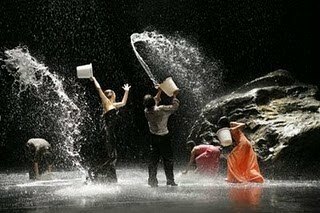 I had never even heard of Pina Bausch, but as far as my few days at the Edinburgh Festival were concerned this was the WOW! Moment and words are simply not enough.